This was created for a friend’s Husband. I absolutely love the wooden boxes Prima put some of their accessories in now they are fantastic to recycled into these little art pieces. I covered this one in Tissue tape, then Matt Multi Medium followed by some Alcohol ink. I think you will agree it comes up a treat. Then it was a matter of playing around and choosing bits to see what would go where and then sticking it all down. I really love how these turn out just wish I had more of the little wooden trays. 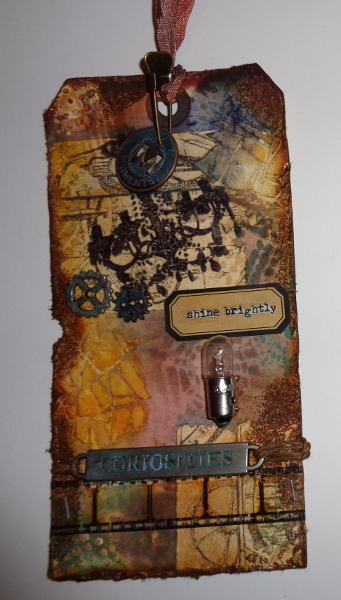 I have to say it is so lovely to not have to feel like I need to hoard my idea-ology embellishments. This is a Tray that had locks and keys in it. I covered it in Tissue tape, then coated that with Matt Multi Medium, dried it and added some alcohol ink over the top. Super happy with how the technique turned out and will def use it again. 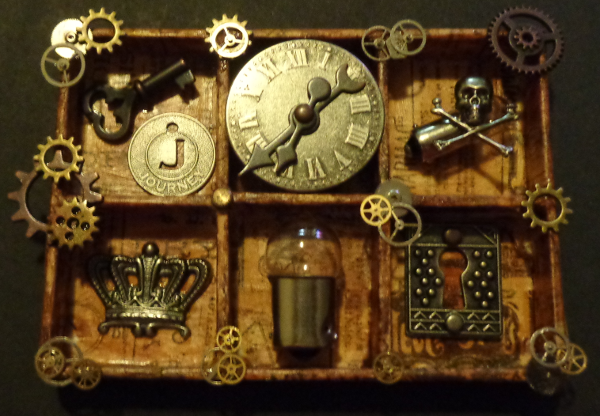 I then pulled out a mix of Idea-ology and watch parts and bingo my little tray was created. Have to say I am really chuffed with how this has turned out. Have to say I am so happy with how this turned out. 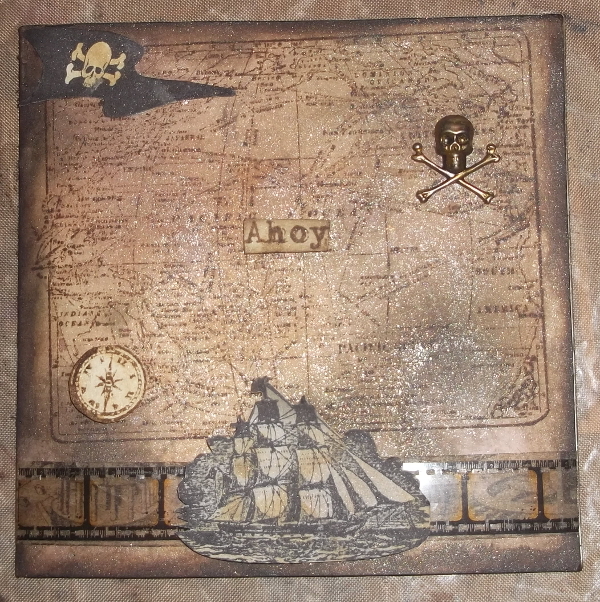 I made it for a friend who reminds me of a Pirate and when I set out to make the card I thought oooh I want to do a treasure type map card. I forgot how much I love to make something look old and aged even if it was white to begin with. The background is a combo of Handmade distress re-inker mists, glimmer mist, and Tsukinedo walnut mist. 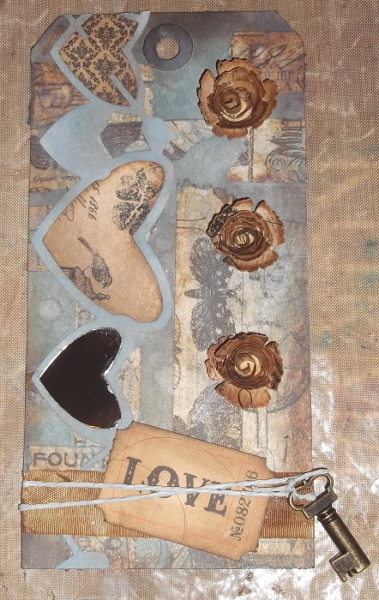 I used stamps from Tim Holtz, prima and some from a cheap pirate and princess set I have mostly stamped in Distress ink and Archival Jet Black. And I even parted with one of the Idea-ology skull and crossbones charms which I rubbed a little bit of distress paint over to make it fit the card a wee bit better. Anyway that is my Aged Pirate Card that I had a lot of fun experimenting and stepping out of my usual clean uncluttered style with. It is that time again (where is this year flying to? Other than Substituting Iced Spruce stain for the weathered wood and creating my own mask with cardstock and repositionable tape (something I learned from The Online Card Classes I took a while back). I used the Air Travel Stamp Set as well as a Donna Salazar Stamp from my prize pack I won last year. Along with frayed burlap stain, weathered wood ink, and some leftover letterpress ink on the brayer that made the funky black patterny marks.